2. Where to find fresh-dead shells ? 3. Where to observe living shells ? First, I would like to say something about general environment protection. There are some rules that any collector must follow to avoid shell extermination… I agree with collectors who say that moderate collecting does not disturb the life chain. But, we must admit the fact that the shells taken live from the oceans will not be able to reproduce anymore ! So please be carefull with living shell collecting. Personally, I prefer collecting fresh dead seashells. I must say that fresh dead specimens I regulary find are GEM, sometimes shells have a drilled hole somewhere (predator's attack), but is it important ? I really prefer to collect a GEM drilled empty shell than a GEM live one. Many collectors go that way now, and this is a real great thing ! But I agree that you may never find the fresh-dead specimen of rare species. And so if you find one specimen alive, you will probably collect it… It is really difficult for a collector who finds a shell which he had been searching for years, alive and not collect it… Remember that if you buy a live taken shell it is exactly like if you had killed it yourself ! 2. Where to find fresh-dead seashells ? Finding fresh empty seashells is easy, but you will need to experiment a lot and improve some skills… In this section I won't speak about beachcombing… anybody is able to do it. 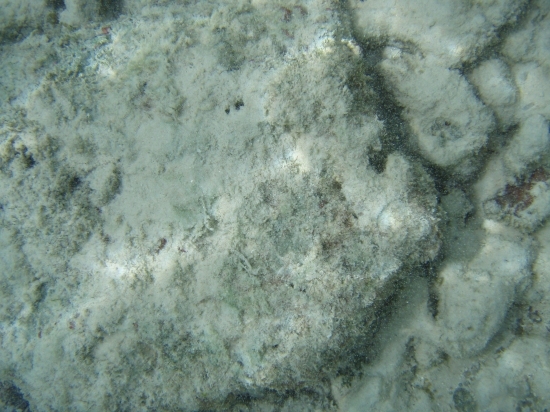 I am going to expose you the means to find dead shells when snorkeling. 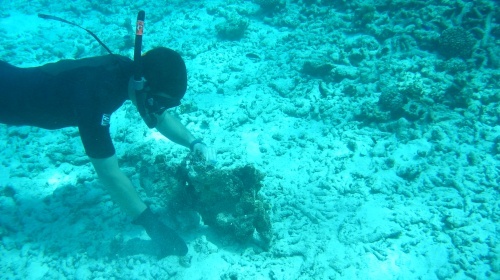 First, you must not look at anything except shells (like fish, etc…), keep your eyes on the bottom of the sea ! Of course, if you do not know what you are looking for, you will not find anything. Read shell books to memorize the overal shapes & colors of seashells (especially shells that have a periostracum). Try to swim at depth from 1 to 10/15 meters, not more (difficult to see shells/dead coral plates on the seabed over 15m…). Try to swim slowly, to let your eyes adapt to seabed. Of course, if you wear glasses, try to swim with something which allows you to see normally (special mask), I personally use a mask with Corrective lenses. 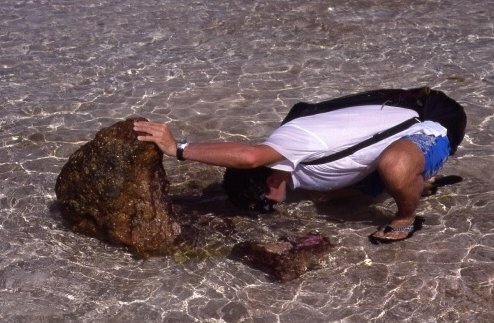 It is difficult to look for any shell type (possible after hundreds of hours of searching…). 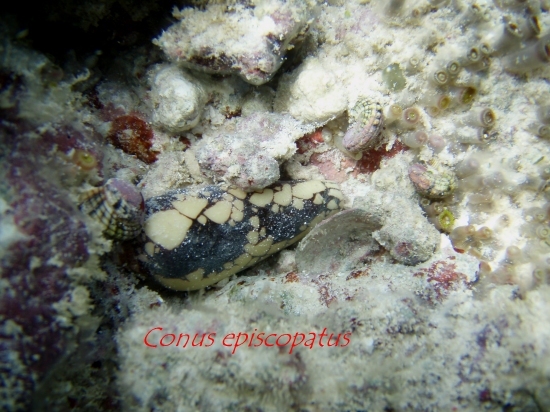 For example, Conus species have often a great camouflage, so you will need to get used to the shape of this family. If you don't focus on this, you will swim over specimens… It is sometime good to concentrate your efforts on a particular family (same for live shell searching). 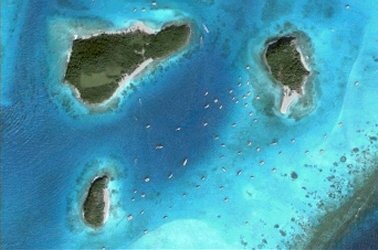 – places where the currents amass rubble, corals, broken parts of shells and dead shells. For example it happens often between two big rocks near the coast, where the coast makes sort of a "V". 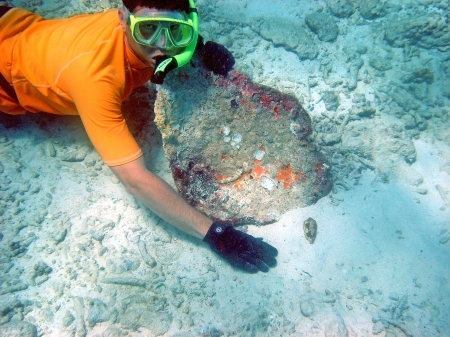 – around octopus "homes"(holes), as octopus are great shell hunters, they will often leave good looking shells. 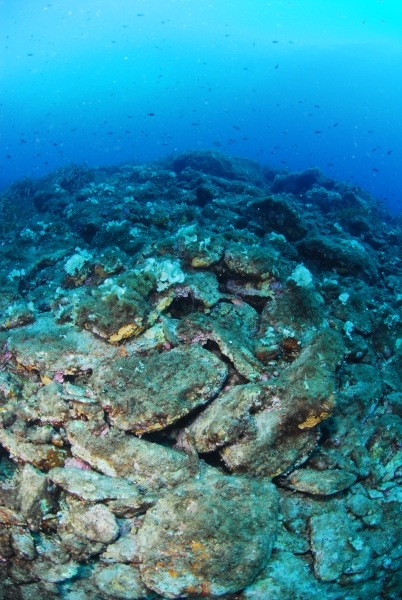 To find octopus lair, look for shells, part of shells and broken shells accumulation. In some countries, octopus will brake the shell, drill holes and in other they won't. Do not kill octopus please ! They can give you so much ! 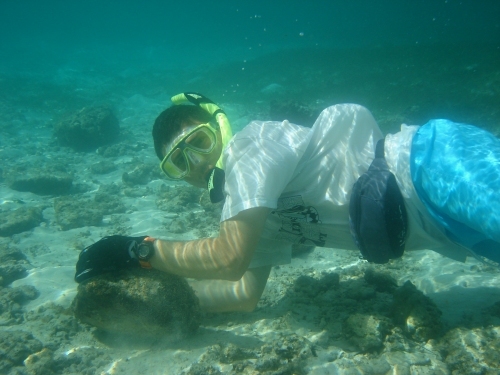 – under huge rocks, shells can be stuck for a while (waiting an hermit crab to get in…). 3. Where to observe live seashells ? This only depends on the type of shell you are looking for. Remember that most of shells feed at night. During the day they are generally hidden. 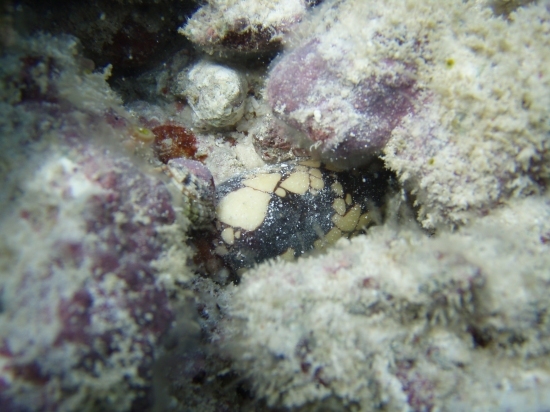 Two ways for a shell to hide : burrowing in the sand or hiding in shadow spots : under rocks, in rock crevices, in coral formations. You must look everywhere, you may need an underwater light to explore rock holes ans crevices. Another important thing : knowledge of shell habitat. When you find an interesting specimen, have a look around to determine in what kind of habitat your found it. Read books and online articles, so when you swim, you will look exactly where you have to ! 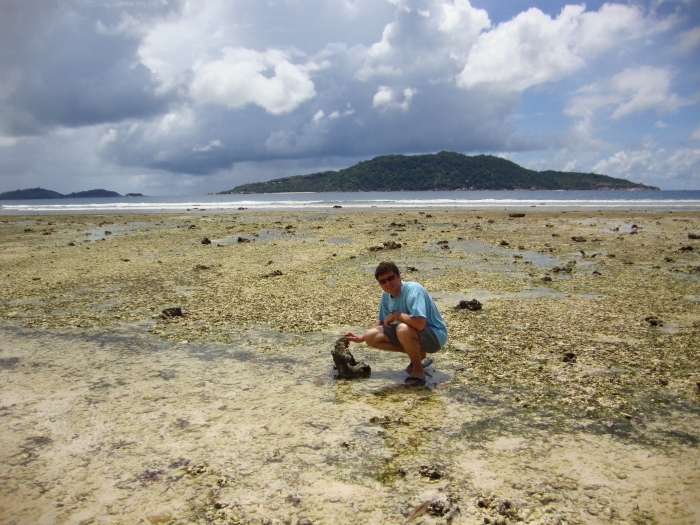 The best way to hunt seashells, is lifting rocks or dead pieces of coral. It is the easiest way to proceed. But always put the rock or dead coral back like it was ! If you leave it up-side-down, you will kill all the life hiding from the sun's action, this life is very important to all life cycles. 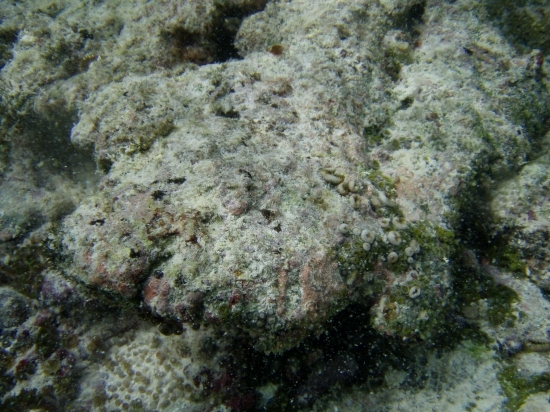 Also, many shells feed on these organisms… So turn back rocks and dead corals after fliping. This is one of the best ways to look for Cypraeidae. 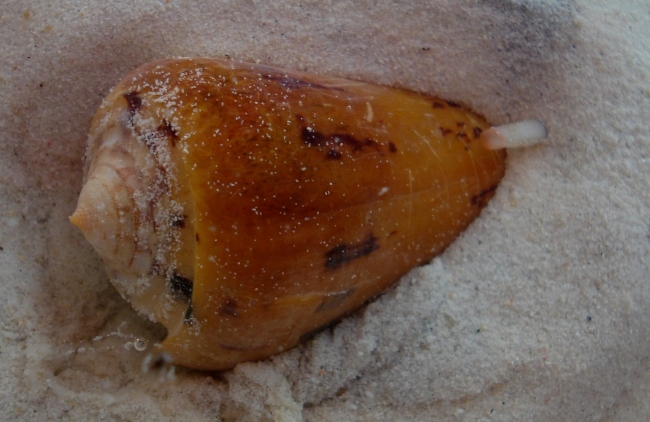 (And you may find also cones in the sand beneath…). 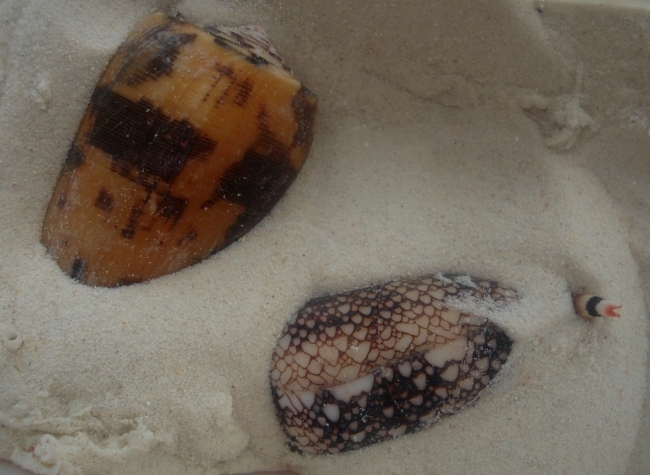 To find shells like cowries , you can look also in rock-coral dark holes, crevices (a small light is often required). 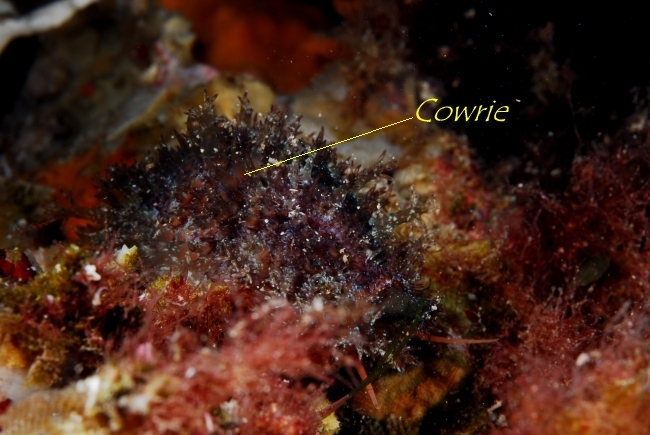 The cowries are often on the roof and walls of the cavity… and rarely on the bottom. This cowrie (Cypraea spurca – France) with mantle out really looks like grass don't you think ? 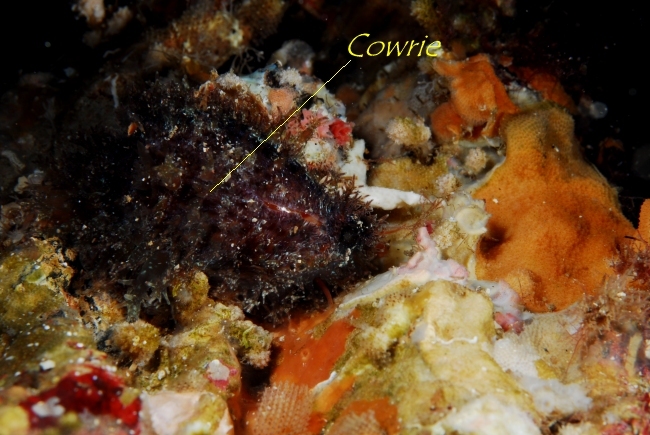 What about this cowrie (Cypraea spurca – France) ? 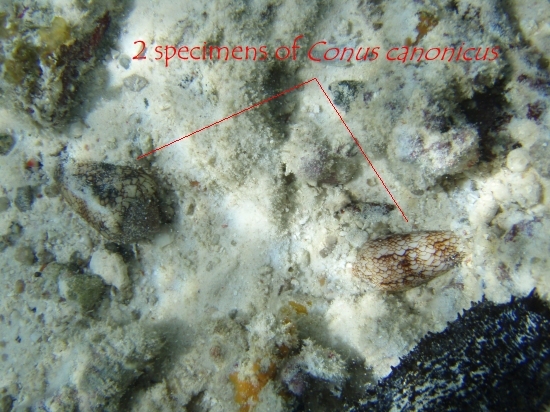 For sand dwellers, you will need to remove the first cm (0-10cm) of sand around the rocks-corals, or under rocks-corals especially Conus). If you see a long line in the sand, follow it and dig at the two extremities… the shell (typical of Olividae, Mitridae, Terebridae,…) will be there. You may also look in sea-grass environments. Many shells hide in grass fields.